When I was in boots recently I was looking at the Maybelline section and got a bit too excited whenever I seen that there was a black colour tattoo. Now don't get me wrong this could of been out from the launch of the colour tattoos, but this was my first time discovering it. Anyone that knows me, knows how much I love black eyeliner!! So when I seen this I thought it would be a great new gel liner , as I know from the other colour tattoos how long lasting and great quality of products they are. Timeless black looks like its matt black, but when photographed blue glitter shows up, but to be honest it just applies as a matt black! None of the glitter shows up when applied. I found it really easy to apply and I think this would Also work Great as a base for a smokey eye. I think this is a great product and it's only £4.99!!! 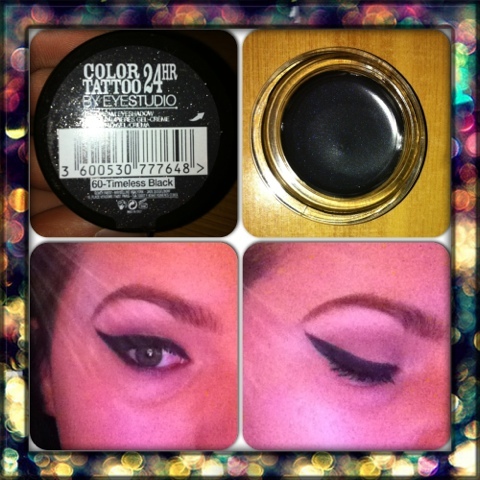 I will definitely recommend this for all those liner lovers who want a long lasting products thats great value! They are also part of the 3 for 2 offer that's on in Boots at the minute.